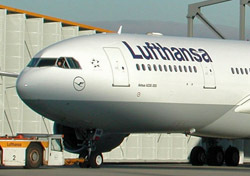 Lufthansa is the latest large carrier to float the notion of incorporating flights into a low-cost subsidiary airline. The German company announced yesterday that it will operate some flights in Europe under the discounted carrier Germanwings starting in 2013. A handful of airlines have already made the move, including Air India, Iberia, Japan Airlines, Qantas, Singapore, and Thai Airways, with several others thinking about it. Big airlines establish these subsidiaries—or at least try to—for two related reasons. They must keep up with aggressive competition from independent low-cost airlines, especially for short-haul routes where the market does not demand the opulent high-cost and high-profit business-class service that the parent lines provide. (In this instance, Lufthansa is struggling to compete with easyJet and Ryanair.) Airlines also struggle with significant obstacles to reducing costs of their own short-haul operations, most notably labor laws and long-term contracts that make increasing efficiency and downsizing extremely difficult. For the most part, these low-cost subsidiaries take over many of the main airline’s less profitable short-haul routes. Typically, they develop code-sharing schedules that, to travelers, provide little distinction between the big airline and the subsidiary. As with other low-cost airlines, the subsidiaries typically provide minimum levels of cabin service and tight seating, with fees for many formerly included service features. The difference, however, is slight; for the most part, the giant airlines have similarly downgraded their own economy services. Yes, major airlines may still maintain the semblance of a business-class in their short-haul service, but it can be no better than standard economy plus a free drink. In the U.S., Delta and United mounted low-cost subsidiaries at one time, but neither lasted very long. The reason seems to be that U.S. laws and general labor conditions make it much easier for big airlines to cut labor costs on their main services than it is in Europe and Asia. Low-cost subsidiaries haven’t been a complete success overseas, either: BMI is shutting down its low-fare subsidiary, Bmibaby. Although most existing and failed low-fare subsidiaries concentrate on short-haul services, a few, notably Singapore’s Scoot, offer longer haul flights. And Air Canada, which earlier tried to shut down two low-cost short-haul subsidiaries, is reportedly considering a long-haul low-cost affiliate to compete with Canada’s robust charter airlines for traffic to Caribbean beach destinations.